If you looked carefully at our recent post on the late Ashod Pinajian's drawing of an old-time Armenian outing, you certainly spotted the figure of Nalband the Packard salesman. That was my mother's maternal uncle Aram Nalbandian. I remember him as a strikingly handsome older man -- bald and always dapper -- who smoked big cigars. He was one of six Nalbandian siblings including my grandmother who made their way two-by-two from Dikranagerd to America before the First World War. The Nalbandians settled in Chelsea, Mass., where they joined many other Armenian immigrants who found work in shoe factories. Uncle Aram (we usually called him Uncle Ray, his Americanized name) was just a kid then, but he reached working age by the time the family moved on to Union City, New Jersey, in the 1920s. There, eldest brother Hagop opened a grocery store that became a community landmark. Uncle Ray somehow got a job selling Packards. I say somehow because it seems so unlikely. Packards were the premier American automobiles of their day, sometimes called The American Rolls-Royce. They were long, powerful, beautiful cars that cost a fortune -- and not a small fortune either. No one could possibly think the Armenians of that era were likely purchasers, and Uncle Ray could hardly have been mistaken for the son of an Englishman. But he did have a great, outgoing personality and a sense of humor as powerful as the Packard's famous Twin Six motor. One of the perks of the job was a demonstration car. My mother used to laugh when she recalled the astounding sight of a smiling Uncle Ray driving through the tenement streets in a car fit for a king. It must have seemed unreal to these Armenians who could barely afford streetcar fare. Coming across the old drawing got Robyn and me talking about Uncle Ray, which brought to mind a little day trip we'd been putting off far too long. So we hopped in the car and drove an hour south to visit the Fort Lauderdale Antique Car Museum, which is devoted exclusively to Packards. Even if you don't give a toot about old cars, it's a wonderful place to visit if you're ever in South Florida. It's an enjoyable bit of time travel back to a day when American engineering and craftsmanship were truly the standard of the world. Oh, sorry. Standard of the World was Cadillac's motto -- but really, when's the last time a Cadillac turned your head? 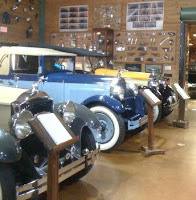 The 38 Packards on display in this dolled-up warehouse really do dazzle you with color, style and history.. It's impossible to look at these cars and not think of the movie stars, industrial barons and statesmen who drove them -- or whose chauffeurs did. Among the Packards on display: the car that carried Calvin Coolidge to his inauguration as President. For us, it was impossible to look at these cars and not think of Uncle Ray, which made me smile.